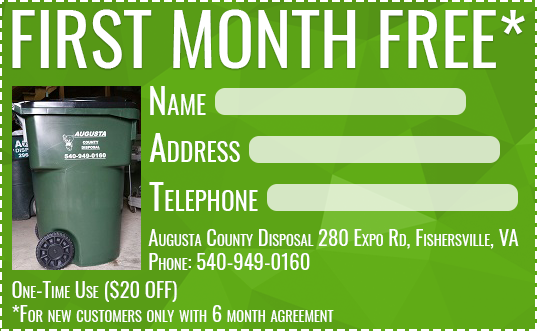 Call today and sign up or online we will deliver our Augusta County Disposal 96 Gallon Trash Cart to you. When you call please let your account representative know if you want our free recycle service with your weekly trash pickup and that you have a one month free coupon you can be billed quarterly, monthly or you can pay for 1 year and get 2 months free. We love hearing the wonderful things our current customers have to say about us. As a caring, family-owned-and-operated disposal company, we believe that we continue to grow because we put our customers first and do a good job every day. That is our trademark at Augusta County Disposal! Unlike some of our competitors, you can get in touch with us absolutely every day. We live here and we count on you the way you count on us.